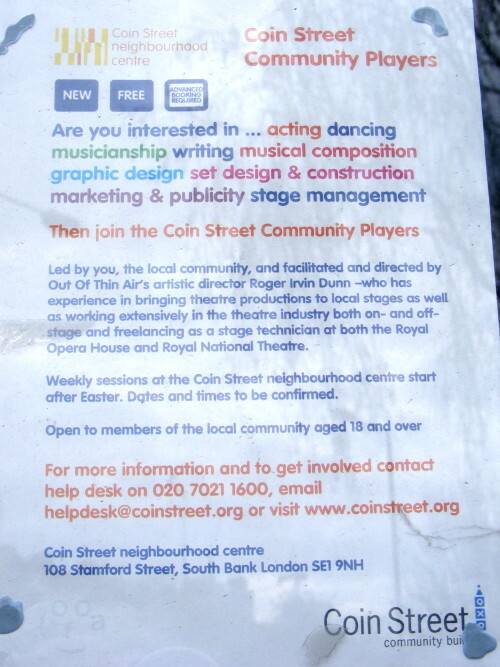 Amateur Drama company in SE1? i have just moved here and as i am settled now i would really like to join an amateur drama company to play a part. have you got any companies/groups that i could contact to join them? The Inner City Players will be meeting for the first time this year on Friday so a good time join. The production this year will be either Little shop of horrors or Into the Woods. Its at the Lambeth Mission on Lambeth Road at 7pm. Just go in and introduce yourself. Give the Network Theatre Company a go. They are based under Waterloo station. I've been with them about 10 years and as they do four or five productions a year there are plenty of opportunities; on stage, backstage, front of house, lighting, set design and construction, directing. Hi Jac - do they have a website or anywhere to see more details? You could do worse than getting hold of a copy of Sardines Magazine - http://www.sardinesmagazine.co.uk/ - they list most London and Home Counties groups.